Extra player wait outside the blue line and the coach shoot in a puck when needed. Give close support to the puck carrier and make the play right away. Play from 1-1 to 4-4 or with uneven numbers like 3-2. 1. Cross ice game of 2-2 and both teams have two Jokers behind their net. 2. 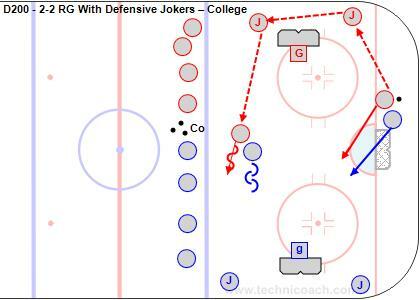 Defenders must regroup with a Joker behind the net to be on offense. 3. Jokers can either pass or shoot. 4. Play 30’ and Jokers rotate as players, players out and new players become Jokers. 5. Either leave the puck on the whistle or pass to your Joker who now is a player. 6. Keep score and losing team skates or some other consequence. *Modified rules like only 2” with the puck can be added. *A rule like Jokers must shoot works on screening, tipping, boxing out, etc.